Summary: New sensors that can monitor dopamine secretion in a single neuron could help researchers better understand how dopamine influences brain activity. New technology could help neuroscientists understand how dopamine influences brain activity. MIT chemical engineers have developed an extremely sensitive detector that can track single cells’ secretion of dopamine, a brain chemical responsible for carrying messages involved in reward-motivated behavior, learning, and memory. 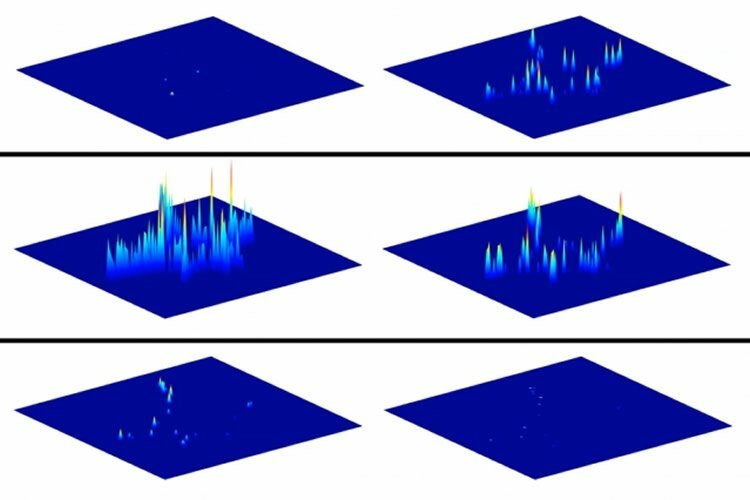 Using arrays of up to 20,000 tiny sensors, the researchers can monitor dopamine secretion of single neurons, allowing them to explore critical questions about dopamine dynamics. Until now, that has been very difficult to do. “Now, in real-time, and with good spatial resolution, we can see exactly where dopamine is being released,” says Michael Strano, the Carbon P. Dubbs Professor of Chemical Engineering and the senior author of a paper describing the research, which appears in the Proceedings of the National Academy of Sciences the week of Feb. 6. Strano and his colleagues have already demonstrated that dopamine release occurs differently than scientists expected in a type of neural progenitor cell, helping to shed light on how dopamine may exert its effects in the brain. The paper’s lead author is Sebastian Kruss, a former MIT postdoc who is now at Göttingen University, in Germany. Other authors are Daniel Salem and Barbara Lima, both MIT graduate students; Edward Boyden, an associate professor of biological engineering and brain and cognitive sciences, as well as a member of the MIT Media Lab and the McGovern Institute for Brain Research; Lela Vukovic, an assistant professor of chemistry at the University of Texas at El Paso; and Emma Vander Ende, a graduate student at Northwestern University. Dopamine is a neurotransmitter that plays important roles in learning, memory, and feelings of reward, which reinforce positive experiences. MIT chemical engineers have developed an extremely sensitive detector that can track single cells’ secretion of dopamine. These video stills show a single cell releasing dopamine. NeuroscienceNews.com image is credited to Strano Lab. Neurotransmitters allow neurons to relay messages to nearby neurons through connections known as synapses. However, unlike most other neurotransmitters, dopamine can exert its effects beyond the synapse: Not all dopamine released into a synapse is taken up by the target cell, allowing some of the chemical to diffuse away and affect other nearby cells. Tracking this dopamine diffusion in the brain has proven difficult. Neuroscientists have tried using electrodes that are specialized to detect dopamine, but even using the smallest electrodes available, they can place only about 20 near any given cell. “We’re at the infancy of really understanding how these packets of chemicals move and their directionality,” says Strano, who decided to take a different approach. Strano’s lab has previously developed sensors made from arrays of carbon nanotubes — hollow, nanometer-thick cylinders made of carbon, which naturally fluoresce when exposed to laser light. By wrapping these tubes in different proteins or DNA strands, scientists can customize them to bind to different types of molecules. The carbon nanotube sensors used in this study are coated with a DNA sequence that makes the sensors interact with dopamine. When dopamine binds to the carbon nanotubes, they fluoresce more brightly, allowing the researchers to see exactly where the dopamine was released. The researchers deposited more than 20,000 of these nanotubes on a glass slide, creating an array that detects any dopamine secreted by a cell placed on the slide. In the new PNAS study, the researchers used these dopamine sensors to explore a longstanding question about dopamine release in the brain: From which part of the cell is dopamine secreted? Neuroprogenitor cell on top os a nanosensor array sensitive to dopamine. Credit: Strano Lab. To help answer that question, the researchers placed individual neural progenitor cells known as PC-12 cells onto the sensor arrays. PC-12 cells, which develop into neuron-like cells under the right conditions, have a starfish-like shape with several protrusions that resemble axons, which form synapses with other cells. After stimulating the cells to release dopamine, the researchers found that certain dopamine sensors near the cells lit up immediately, while those farther away turned on later as the dopamine diffused away. Tracking those patterns over many seconds allowed the researchers to trace how dopamine spreads away from the cells. Strano says one might expect to see that most of the dopamine would be released from the tips of the arms extending out from the cells. However, the researchers found that in fact more dopamine came from the sides of the arms. The team also showed that most of the dopamine traveled away from the cell, through protrusions extending in opposite directions. “Even though dopamine is not necessarily being released only at the tip of these protrusions, the direction of release is associated with them,” Salem says. Other questions that could be explored using these sensors include how dopamine release is affected by the direction of input to the cell, and how the presence of nearby cells influences each cell’s dopamine release. Funding: The research was funded by the National Science Foundation, the National Institutes of Health, a University of Illinois Center for the Physics of Living Cells Postdoctoral Fellowship, the German Research Foundation, and a Liebig Fellowship. Image Source: NeuroscienceNews.com image is credited to Strano Lab. Original Research: The study will appear in PNAS during the week of February 6 2017. MIT “Sensor Traces Dopamine Released by Single Cells.” NeuroscienceNews. NeuroscienceNews, 7 February 2017. MIT “Sensor Traces Dopamine Released by Single Cells.” http://neurosciencenews.com/dopamine-sensor-neuroscience-6075/ (accessed February 7, 2017).